Porphyrias are a group of eight uncommon-to-rare inherited or acquired metabolic disorders, each caused by enzyme dysfunction at various steps in the heme biosynthetic pathway. Photocutaneous porphyrias are a subset characterized by acute skin pain and/or chronic skin lesions as major features of disease signs and symptoms. 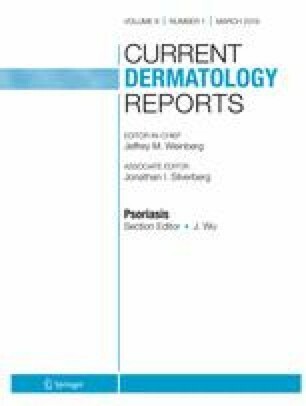 Clinical and laboratory features, epidemiology, genetics, pathologic mechanisms, and current and future therapies of the photocutaneous porphyrias are discussed, with emphasis on information reflected in recent literature. Clinical and laboratory investigations of the last two decades have elucidated many aspects of the several porphyrias, especially in areas of genetics and genomic medicine. Published reviews, original investigations, and case reports of the last several years are too voluminous to list exhaustively; many are cited in literature referenced herein. Recent progress in unraveling and solving enigmas posed by porphyrias suggests that newer and better approaches to their management, and possible life-altering, or even curative, therapies can be anticipated in the foreseeable future. Maureen B. Poh-Fitzpatrick was an consultant for Clinuvel Pharmaceuticals. All reported studies/experiments with human or animal subjects have been previously published and have complied with all applicable ethical standards (including the Helsinki declaration and its amendments, institutional/national research committee standards, and international/national/institutional guidelines). Yasuda M, Chen B, Desnick RJ. Recent advances on porphyria genetics: inheritance, penetrance & molecular heterogeneity, including new modifying/causative genes. Mol Genet Metab. 2018. https://doi.org/10.1016/j.ymgme.2018.11.012. Singal AK, Anderson KE. Variegate Porphyria. 2013 Feb 14. In: Adam MP, Ardinger HH, Pagon RA, et al, editors. GeneReviews® [Internet]. Seattle: University of Washington, Seattle; 1993-2019. Available from: https://www.ncbi.nlm.nih.gov/books/NBK121283/. Accessed Jan 2019. Wang B, Bissell DM. Hereditary Coproporphyria. 2012 Dec 13. In: Adam MP, Ardinger HH, Pagon R, et al., editors. GeneReviews® [Internet]. Seattle: University of Washington, Seattle; 1993-2019. Available from: https://www.ncbi.nlm.nih.gov/books/NBK114807/. Accessed Jan 2019. Peoc’h K, Manceau H, Karim Z, Wahlin S, Gouya L, Puy H, et al. Hepatocellular carcinoma in acute hepatic porphyrias: a Damocles Sword. Mol Genet Metab. 2018. https://doi.org/10.1016/j.ymgme.2018.10.001. Balwani M, Bloomer J, Desnick R. Porphyrias. Erythropoietic protoporphyria, autosomal recessive. 2012 Sep 27 [Updated 2017 Sep 7]. In: Adam MP, Ardinger HH, Pagon RA, et al., editors. GeneReviews® [Internet]. Seattle: University of Washington, Seattle; 1993-2019. Available from: https://www.ncbi.nlm.nih.gov/books/NBK100826/. Accessed Jan 2019. Bonkovsky HL, Rudnick S. Erythropoietic protoporphyria and X-linked protoporphyria. Merck Manuals Professional Version. Updated Feb 2017. Available from: https://www.merckmanuals.com/professional/endocrine-and-metabolic-disorders/porphyrias/erythropoietic-protoporphyria-and-x-linked-protoporphyria. Accessed Jan 2019. Balwani M, Bloomer J, Desnick R. X-linked Protoporphyria. 2013 Feb 14. In: Adam MP, Ardinger HH, Pagon RA, et al., editors. GeneReviews® [Internet]. Seattle: University of Washington, Seattle; 1993-2019. Available from: https://www.ncbi.nlm.nih.gov/books/NBK121284/. Accessed Jan 2019.